Bestselling author David Gillespie turns his attention to a phenomenon that damages businesses, seeds mental disease and discomfort and can bring civilisations to the brink of implosion – the psychopath. Psychopaths are often thought of as killers and criminals, but actually five to ten per cent of people are probably psychopathic without ever indulging in a single criminal act. 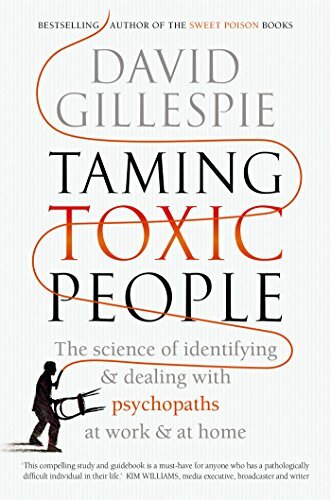 These everyday psychopaths may be charming in the early stages of relationships or employment but, Gillespie argues, their presence in your life is at best disruptive, and at worst highly dangerous: they will leave you feeling cheated and humiliated, dominating and manipulating you to the point where you question your sanity. Worse, he cautions, at a societal level their tendency to gravitate towards positions of power can be disastrous. Taming Toxic People is a practical guide to restraining that difficult person in your life, be it your boss, your spouse or a parent. But it is also a serious and meticulously researched warning: if we value a free and well-functioning society, we need to rebuild the sense of community that has historically kept the everyday psychopath in check, and we must understand and act to manage the psychopathic behaviour in our midst. David Gillespie is a recovering corporate lawyer, co-founder of a successful software company and consultant to the IT industry. He is also the father of six young children (including one set of twins). With such a lot of extra time on his hands, and 40 extra kilos on his waistline, he set out to investigate why he, like so many in his generation, was fat. He deciphered the latest medical findings on diet and weight gain and what he found was chilling. Being fat was the least of his problems. He needed to stop poisoning himself.